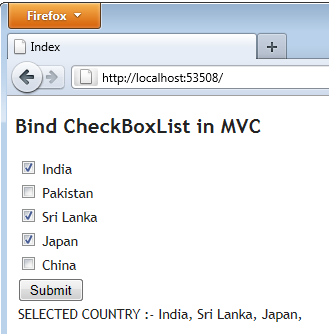 In this article I will show you how you can bind a checkboxlist in an mvc application using c#.net by using entity model and how you can retrieve the selected checkbox value in at controller. This article you an use in MVC3,MVC4 and MVC5. Some of my previous articles are as follows: jQuery Validation for Terms and Conditions Checkbox in Asp.Net, Code to Select All Checkbox in GridView in Asp.Net Using jQuery. 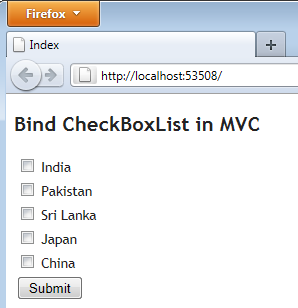 So for this article first we will create a new mvc application. Now we will add model file in our project and add the below code. Now we will add controller in our application and add the below code in it. In above code we have added httpget and httppost method both. In above code we have stored data viewbag to display at view end. Now create view for the controller and add the below code. Now we will run the application and check the output. As you run the application we will get below screen. Now we will select the value and click on submit button. You will get the data from view to controller as shown below. Now we will press F5 to view the final output. Now how do I bind this to a sql data table column? You just need to follow the below step. 1. Retrieve the data from database. 2. now apply lop to add the DB value in the collection. Ok, I can retrieve list from the database but I cannot post the data. That is the problem that I am having. How do I post the appended comma separated list to a table column? If you are have value comma seprated on that case just assign it to a model property. if you are still facing problem then please attach the sample code of you application. My view is the same as above I just added one line. I am trying to link it like this but it is not working. I do not want to use viewbag. I'm using EditorFor of which eventually will be turned into HiddenFor. How do you implement this if you already have data in a table, having multiple views and showing the checkboxlist on the same view with other models? I am storing the detail in table and passing it to view. Now on view i am generating the checkbox on the bases of no of record on model. Just check the for loop. If this is not the answer of you question please explain me ur exact problem which you are facing. I don't know what I forget. how i can make atleast one checkbox to be selected in that view? and validation error "select atleast one"